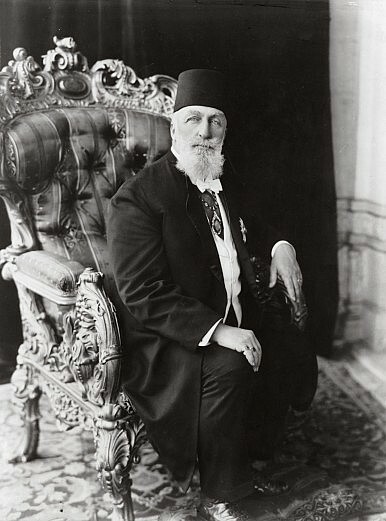 Abdulmecid II, the last Ottoman Caliph. And why the idea of a caliph just won’t work. In a surprising development, the Islamic State of Iraq and the Levant (ISIL) recently renamed itself simply the Islamic State (IS) and announced the reestablishment of the Caliphate, headed by the Caliph Ibrahim, formerly known as Abu Bakr Al-Baghdadi. This would allegedly be the first time a Caliph has been proclaimed since the abolishment of the Ottoman Caliphate in 1924. A Caliph is a person who is, in theory, the political and spiritual leader of all Muslims. This event has been treated as a major milestone by the media and many in the West, as well as some alarmist figures in Iraq. This is because of the enormous, romanticized emphasis both Islamist and orientalist Western thought have placed on the idea of the Caliphate as the harbinger of golden ages and unity. However, the present announcement of a Caliph will be largely irrelevant, just like the concept has been superfluous throughout most of history. A brief look at Islamic history reveals that the Caliphate has never been a singular institution and quite often not one that wielded any spiritual or political power. In fact, there has never been a time where the title of Caliph has not been contested. There has never been a Caliphate that has brought political stability and unity to all Muslims. After the death of the Prophet Muhammad, his companions ruled the Rashidun Caliphate, which is often touted as the ideal Caliphate by Islamists. However, schism developed even during this Caliphate, and the first three Caliphs were not truly accepted by the followers of the fourth, Ali, son-in-law of the Prophet Muhammad. These followers later became the Shia. Today’s Shia, who account for about a fifth of all Muslims, do not even believe in the concept of the Caliphate, instead holding that spiritual authority is vested in Imams descended from Ali, the last of whom disappeared into occultation a millennium ago. Ali had frequently fought the family that became the hereditary Umayyad Caliphate after his death. These were in turn overthrown by the Abbasid Caliphate but continued to rule in Spain. In time, the Shia Fatimid Caliphate emerged in Egypt while another Sunni group, the Almohads claimed the same title in Morocco. The Abbasids themselves became puppets from the tenth century onwards, to dynasties with actual power. Indeed, after the Mongols destroyed the Abbasid Caliphate in 1258, the institution lost any meaning. As University of Michigan Professor Juan Cole points out, the term Caliph became a title that any strong ruler could attach to his list of titles, without anyone taking such claims seriously. As such, “sultans or secular emperors sometimes were termed ‘caliphs’ in flowery style by their courtiers.” The Ottoman Sultan was just one such ruler. Simultaneously, the Mughal Emperor also claimed the title, along with various other states, such as the Sokoto Caliphate in West Africa. This goes to show that merely claiming the title of Caliph did not entitle anyone to sole spiritual and political power, nor will it guarantee the survival of anyone’s state. As the Ottomans were the last surviving traditional Muslim power in the late nineteenth century, theirs remained the sole Caliphate. This combined with Muslim movements against colonialism led to a reinterpretation of the idea of the Caliphate as that of an institution that had authority over all Muslims, especially in places under British, Russian, and French control. This claim, however, had no practical effect, and Indian Muslims, for example, did not rise en masse against the British. However, the concept that a single Caliph would somehow reunite all Muslims and usher in a new Golden Age took hold among many Islamists in the 20th and 21st centuries. The goal that the new Caliphate in Iraq and Syria aims at seeks to reinterpret the history and nature of the Caliphate to fit its views. It also somehow believes it can overcome the natural tendency in human nature for schism. Almost all Caliphs have been rejected by other Muslims throughout history. Today, the Islamic world is large and diverse enough that the announcement of any Caliphate will have very few, if any political and spiritual implications, and these will be local. So far, IS’ announcement has been greeted mostly with derision and rejection. After all, a Caliph is not necessary for a Muslim to practice Islam. As in the past, any Muslim state or leader with sufficient power has a tendency to aim at being a Caliphate or a Caliph, and there is no reason to think that today would be any different. In fact, IS has defied Al-Qaeda itself, which would have probably named their own Caliph eventually, when they decided the conditions were right, in line with their position on the issue. Mullah Omar, the leader of the Afghan Taliban has, in fact, been previously acclaimed as a Caliph and there is no evidence that he has ever renounced that claim. So there are now at least two Caliphs and it would not be surprising if more proclamations occur in the near future. Multiple claimants, of course, weaken the ability of any one Caliph to claim to be the leader of all Muslims. The dream of a unified, strong Caliphate was largely invented only a century ago in response to external factors after having largely disappeared from Muslim history for over a thousand years. But as history has shown, the conditions probably never did and never will favor a single Caliphate that can actually exercise spiritual and political authority over all Muslims. Anyone could claim to be Caliph as could multiple people at once. The idea that there was a single, unbroken chain of Caliphs from the seventh century to the 20th century that simply needs to be revived is flawed and Muslims seem to understand this intuitively though many long for the ideal. The proclamation of a new Caliphate in Iraq and Syria is irrelevant. The universal Caliphate is a pipe dream. It makes no military or political difference to the conflict that is raging in that area, and as such, is of little consequence or worry for the West or even for other Muslim states. It will have negligible spiritual impact. What really matters is the raw physical, military power or lack thereof of the Islamic State. This is what can make or break it, just like other Islamic states of the past such as the Mughals and the Ottomans. Like those states, the Islamic State has to govern and win battles to survive and gain legitimacy and whether or not it calls itself a Caliphate is irrelevant for that. “Caliph” Ibrahim can add that title to his list of titles as a flourish, like many previous rulers have, but it really doesn’t mean anything in the end.